Please read below about the courses we currently have on offer. We hope to add more courses in years to come. If you are interested in going on one of our courses please download this booking form and send it to info@paradance.org.uk. If you need any other assistance please do not hesitate to call us on 0300 111 30 45. This course is for anyone wanting to run or be involved with Inclusive Dance sessions. This course is suitable for dance teachers who wish to open their services to all abilities, those involved with sports and social groups and people with a focus on disability and the care environment. There are no entry requirements for this course, other than an interest in learning more about the subject. Para Dance UK welcomes applications from people with any ability and with any impairment to train to lead Inclusive Dance. In taking the IDT you will learn about a variety of disabilities and impairments as well as basic physiology and mobility aids which you may encounter in your role as an Instructor. You will also learn the fundamentals of instruction technique, choreography and adapting dances in a non-genre specific format for everyone along with how to set up and run a group. The IDT will equip you with the tools you need to start your journey into Inclusive Dance or develop your existing skills. The course is broken down into modules. These modules combine theory and practical aspects. The theory modules are completed online via E-Learning, allowing you to learn and submit worksheets in your own time. Then you move onto three days learning the practical elements of this course before your practical assessment takes place. The course is broken down into Learning Outcomes that are simple statements explaining what you will have to know and understand in order to pass each unit. Once you’ve submitted worksheets they will be individually assessed and returned to you with feedback as necessary and advice on how to improve if required. You will then have the opportunity to resubmit until both you and the independent assessors are happy with the work completed, this takes place within a set timeline. All of your theory worksheets will be completed online and they will culminate in a final assessment 4 weeks before the practical course to ensure you have retained all of the essential information. All successfully completed assessments will be recorded on your Record of Achievement. You will not proceed onto the practical elements of the course until you have attained a satisfactory level in the theory sections and final assessment. What happens if I have not successfully completed the course? If you are unable to attain the required level of practical ability, you will have the opportunity to re-sit this assessment at the next IDT course run. One re-sit is included as necessary within the course fee. Any further re-sits will be discussed and negotiated with Head Office. The cost of this course is £600. You can apply for a bursary with us that could cover all or most of this cost (contact us to request more information). The Debutant Dance Sport course builds on existing knowledge provided by the IDT or similar learning, and is focused on Para Dance Sport. This course will provide you with knowledge of wheelchairs and mobility equipment, partnering, choreography and the rules and regulations surrounding Para Dance Sport, along with the technical knowledge and ability to dance and instruct in this genre. This modular course can be tailored to your previous experience and ensures that you can access the learning that you need to develop as a reflective practitioner. The course combines on-line learning and assessment via feedback by an independent assessor alongside 3 days of practical experience and summative assessment where you will learn the Ballroom and Latin American dances required to take participants forward to debutant level competition or for recreational purposes. The DDS is suitable for anyone with previous learning or experience in inclusive dance and for those wishing to develop their knowledge in this genre. Completion of this course will allow you to become an Affiliate of Para Dance UK, taking advantage of our support systems and public liability insurance and progress your practice. 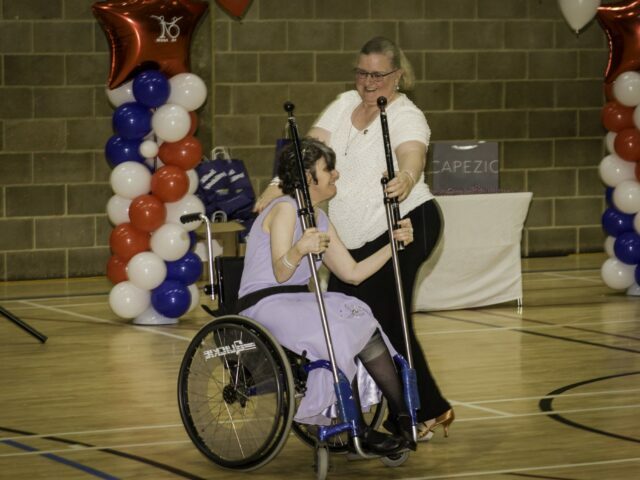 The DDS is suitable for dance teachers who are looking to extend their knowledge into working with mobility aids, those who are currently running or looking to run inclusive dance sessions and would like to include Dance Sport into their programme or those looking to instruct or choreograph for Para Dance Sport Competitions. Instructors who currently hold the WDSA (UK) Level 2 qualification will benefit from this course by increasing their existing knowledge and developing their ability in this specific genre. The course is designed to enable you to develop your own Para Dance Sport skills and prepare you to guide your members to compete at debutante level in Para Dance Sport competitions. 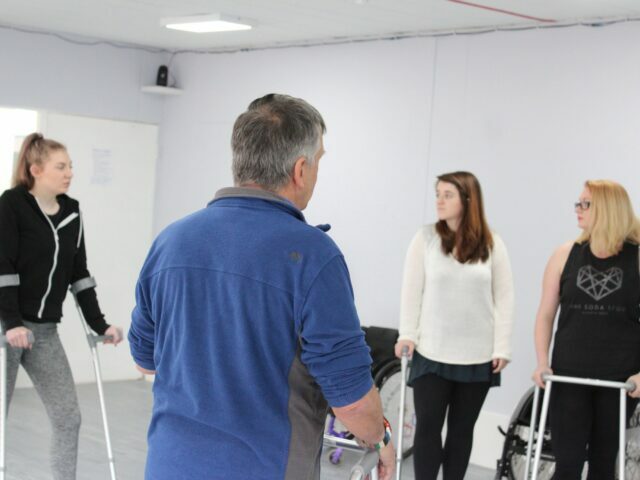 You will learn further techniques for wheelchair use, holds, figures and choreography as well as how to instruct your participants, arrange partnerships and choreograph for each member. You will also gain a useful insight into the world of Para Dance Sport. The course is broken down into modules. These modules combine theory and practical aspects. The theory modules are completed online via E-Learning, allowing you to learn and submit worksheets in your own time. Then you move onto 3 days learning the practical elements of this course before your practical assessment takes place. The course is broken down into Learning Outcomes that are simple statements explaining what you are required to know and understand in order to pass each unit. Once you’ve submitted worksheets they will be individually assessed and returned to you with feedback as necessary and advice on how to improve if required. have retained all of the essential information. If you are unable to attain the required level of practical ability, you will have the opportunity to re-sit this assessment at the next IDT course run. One re-sit is included as necessary within the course fee. Any further re-sits will be discussed and negotiated with WDSA (UK) Head Office. The cost of this course is £650. You can apply for a bursary with us that could cover some of the costs for this course. Our courses are endorsed by EMD UK.